Endless Breeze a powerful, high volume, portable 12 volt fan using an automotive type motor and twelve inch blade that operates at three speeds. Air movement of up to 900 CFM (cubic feet per minute) equivalent of a constant 10 mph wind introduces a major breakthrough in 12 volt portable fans. Portable it is! Standing only fourteen inches tall on retractable legs and less than four inches deep it travels and stores easily and weighs under five pounds. Endless Breeze can be powered by any 12 volt power source such as automotive lighter outlets, connecting jumpers to any 12 volt battery or you can plug in your Endless Breeze in a *110 volt AC, 5 AMP converter. Maximum current draw is three amps. Endless breeze is equipped with an attached 12 volt plug and cord. The uses for Endless Breeze are literally endless! Boats, tents, campers, sleeper cabs, horse trailers, power failures and the family car, van or SUV are a few of many applications. allows easy attachment of the fan to the side or front of your pet crate. Your pet will love it! That allows you to cool your pet before, between and after performance runs or while traveling. Customers tell us they have used them to blow the bugs away on hot muggy nights or even help thaw out the RV refrigerators. 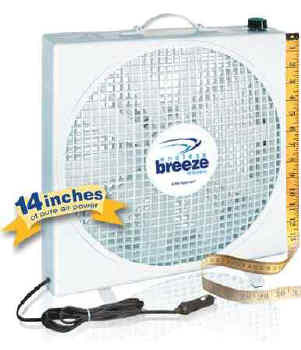 Endless Breeze 12 volt fans are available through mass marketers, specialty stores and specialty catalogs.